In only its 9th year on the PGA Tour schedule The Greenbrier Classic has jumped around the schedule and may have finally found a home in the first week of July. Played at The Old White TPC White Sulphur Springs, this historic course features generous fairways along with challenging, undulating greens. The Greenbrier Classic was cancelled a couple of years ago due to severe flooding that caused damage to the area as well as the course. The area has recovered and the GreenBrier Classic is back to normal! 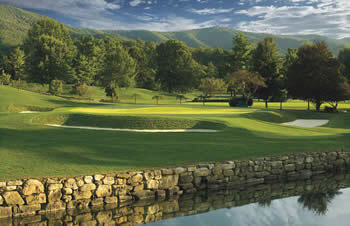 The GreenBrier Classic is used by some PGA golfers as a final tune up for the British Open Championship. The field won't be a strong one, so top ranked golfers that are in the field will be focussed on by fantasy players to claim a win, although in its short history, it’s usually a lesser known golfer that beats out the field. Making golf picks for smaller PGA Tournaments like this one should be left to the experts. Here's a link to the expert golf handicapper we follow most - GolfStats.com - a proven winner. Looking for Fantasy Golf picks for the Greenbrier Classic? One strong tip to consider is checking out what the current betting odds are for the GreenBrier Classic. If the oddsmakers have some guys highly favored to win that are a lower cost at DraftKings then that may be a tip to consider using that golfer in your lineups. If you are playing in a Fantasy Golf contest at FantasyDraft this week you need to get all your players to make the cut. If you know your stuff then you should start selling your own expert golf picks...but if you don't, it may be worth the cash to invest into someone who does.